Actor Jason Momoa was in Hawaii last week, enjoying a vacation and helping to judge the junior lifeguard competition. Of course the new Aquaman took the to the water and bared his muscular chest while smiling and having a good time. The Daily Mail grabbed some photos and gushed over the beach bod and wavy locks of the Aquaman star. And who wouldn’t get a little giddy with some shirtless Jason Momoa photos? 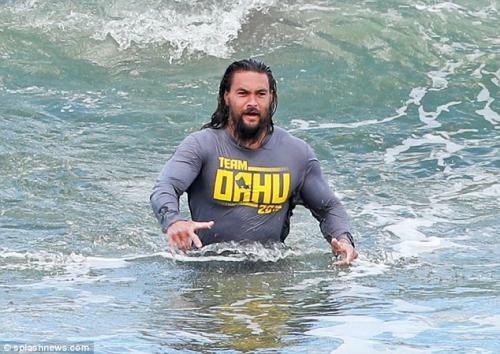 His star turn as DC superhero Aquaman will hit the big screen in a stand-alone adventure in December. And Jason Momoa looked right at home in the water as he took part in the Jr Lifeguard Championships in Kauai, Hawaii last week. The hunky actor, 39, flaunted his chiselled physique as he took a dip with a clinging silver jersey, before ditching his shirt to show off his washboard abs. 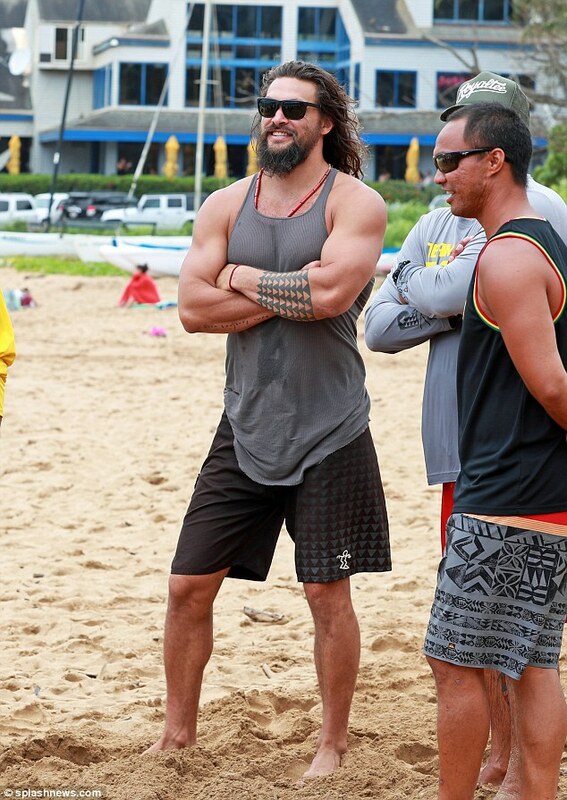 Jason teamed his sporty attire with black swimming shorts and happily took selfies with locals at the event. 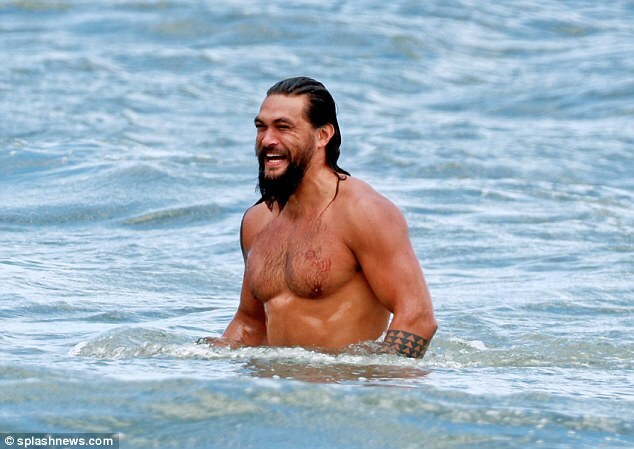 The Game Of Thrones stud highlighted his gym-honed physique in the clinging ensemble, and exhibited his intricate body ink when he removed his drenched shirt in the water. Jason’s lengthy brunette locks fell far past his shoulders, while his signature bushy beard on full display. Before making a splash in the water, the handsome Hawaiian shielded his eyes with classic black shades while wandering along the sandy beach. 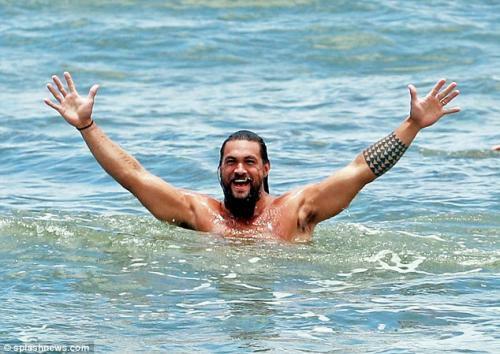 Check out the photo gallery below of all the shirtless Jason Momoa images from Hawaii! Photo credits to Splash News. 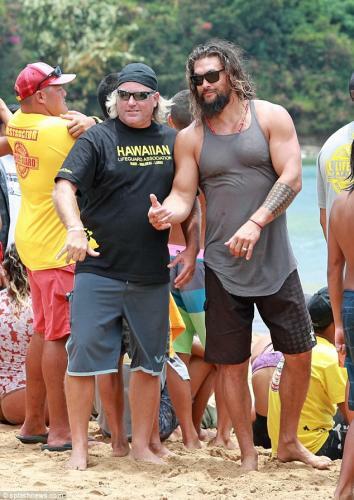 Check out our Aquaman filmography page and photo gallery. Aquaman releases in theaters on December 21st, 2018. Following the events of Justice League, Arthur Curry, the reluctant ruler of the underwater kingdom of Atlantis, is caught between surface dwellers that are always polluting the globe and his own people who are ready to invade the surface.